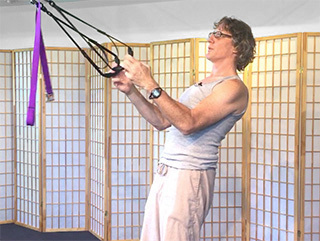 CTB Clinical Bodywork sessions use the techniques of Thai bodywork with trigger point therapy and a structural analysis of body function. CTB is highly effective in reducing or eliminating patterns of pain and restriction, often in cases that have failed conventional medical treatment. It combines compression, percussion/vibration, electronic point stimulation, movement and stretch to retrain muscle fibers that have become dysfunctional and cause pain patterns in the body. The framework of CTB constitutes one of the most efficient and effective approaches available for orthopedic rehab, relief of chronic and acute pain, recovery from injury, and correction of myofascially-derived dysfunction. For more info on trigger points see the FAQ page. Traditional Thai Bodywork (Thai Massage) gives the benefits of massage, yoga, and energy work in one session. It is an ancient healing art form practiced in Thailand. The name in Thai language is Nuat Boran[noo-ut bo-rahn], but in America it is variously called “Thai Massage,” “Thai Yoga Massage,” “Traditional Thai Massage” or “Thai Bodywork.” Boran means “ancient” or “classical” and Nuat is often translated as “massage”, though it is not really “massage” as Americans think of it but a holistic bodywork. Given on a floor mat with clients fully clothed, Thai bodywork is a whole-body treatment. It combines compression, passive stretching and movement of joints . The effect of Thai bodywork is greater flexibility, flow of energy, deep relaxation, and feeling of well being. Corrective Exercise is necessary in rehabilitation to build balanced strength around joints. However, in most physical therapy and exercise therapy, strengthening is attempted without an understanding of why the muscles test weak. Often they test weak due to neurological defacilitation and cannot be strengthened until the trigger points are released. In CTB corrective exercise, the structural and neuromuscular causes of pain, dysfunction, and range of motion limitations are addressed through corrective exercise, integrative movement, yoga, self-compression and contract/relax stretching. A clinical assessment of range of motion and muscle function is the basis for building an effective corrective exercise and strengthening program. The Mighty Body Band is often used to add/subtract stability in exercises and provide dynamic resistance and proprioceptive stimulation. Barbells/dumbells, cable and weight machines are also used when appropriate. Mentoring, consulting and training sessions in thai bodywork, trigger point therapy, manual therapy, pain treatment and prevention, corrective exercise, functional anatomy, self-care and ergonomics are available for professional and student therapists (massage, physical therapy, thai bodywork, personal training etc. ), pain sufferers and the public. These sessions are in-person or remote via phone or video conferencing. Sessions are available for therapists to consult in-person or remotely on general or specific manual therapy pain treatment. The client may be present or not. Instructional classes for larger groups can also be arranged.